MyHarmony is software and hardware to connect your current home automation software together. Using Harmony remotes to create macros you could create scenes by touching buttons on your remote to control your house. 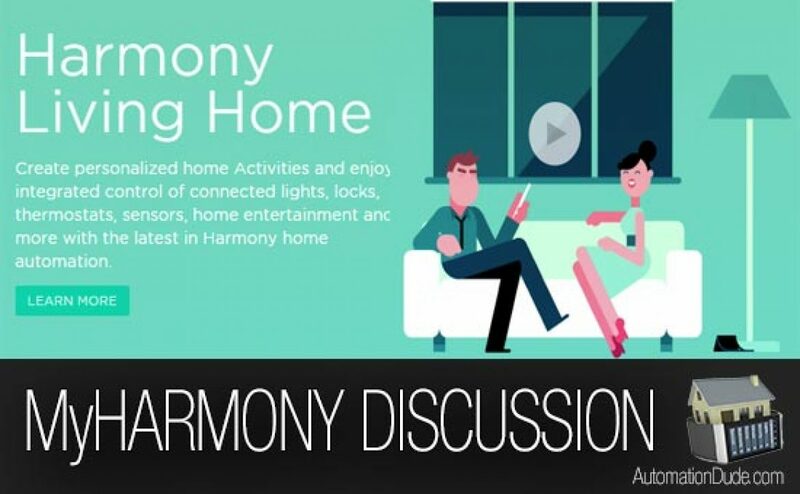 The video above isn’t using JUST MyHarmony products but all the solutions available in the home automation world and by no means is limited to just their service. The base unit contains IR, BLE and WiFi technology which can extend control to your home automation hub. Why would I use it over my smartphone or a Z-Wave Remote? That’s a very good question as they are redundant technologies. There are certainly a large portion of people who would much prefer a physical button to push vs an app on a screen that you have to hunt around to find. That said, you could always create macros in Tasker and use Autovoice or assign a series of hardware button pushes for certain actions. Using a Z-Wave remote for tasks that are in certain rooms makes more sense as usually you only need to fire 4-5 tasks in a bedroom (lights, music and blinds). With a physical remote like the Intermatic HA-07 It’s all you need to create scenes/actions and so forth assuming you’re using software like the Vera, InControl, SmartThings, Wink, or something similar. There is a huge population that has no knowledge of automation technology and pushing buttons on a tablet is a fear based action. Using a remote is comfortable and once programmed to ‘work’ is easy to use and familiar. For these users that gravitate towards remotes over smartphones and tablets it’s an ideal solution for every room in the home. That all depends on the level of disposable income you have. If you are trying to automate your home on a budget you can do all this with said z-wave remote above combined with your smartphone. This solution will extend your hub to allow all the dumb IR devices to communicate with each other. Setting up any logitech/harmony remote isn’t a piece of cake but it’s certainly easier than trying to code Tasker. With a user friendly UI and a great support community you will have better success with this if you have never heard of Tasker on Android. There are lots of IR controllers to communicate with your system. For example, you could purchase a Tab 3 or Tab 4 which has IR and can have custom scenes that are created just like this solution. You would keep this by your coffee table and is half the price with triple the functionality. MyHarmony is an incredible solution for a certain segment of the population that is comfortable spending a lot of money to get things to just ‘work’. Setting the scenes up shown in the video above will not be an easy task. Logitech has put special care into trying to simplify all the procedures and connected to countless API’s so you don’t have to. At a premium price of almost $300 it’s the same cost of a Tab 4 10 inch which has similar technology to accomplish the same thing with less potential to do other things.